OXFORD, Miss. 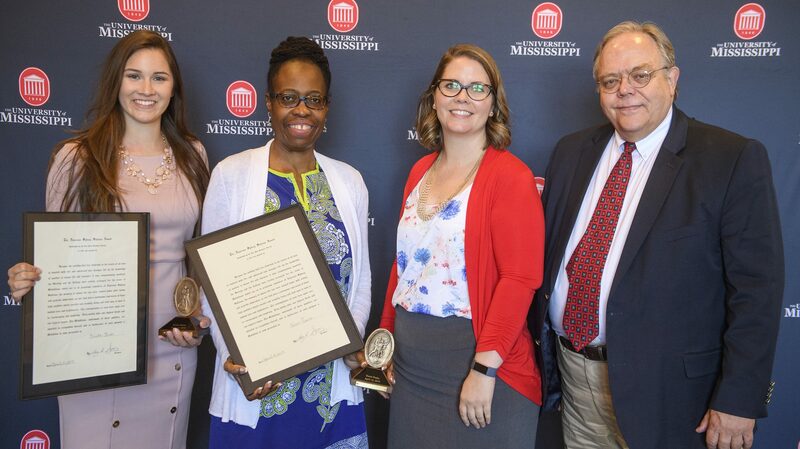 – University of Mississippi faculty and staff members, a student and several external community organizations were honored Wednesday (April 10) in celebration of their community-engaged research, learning and service work within the LOU community and beyond. The annual Algernon Sydney Sullivan Awards and the inaugural Excellence in Community Engagement Awards were presented by the university’s Division of Diversity and Community Engagement to students, faculty, staff and community members who demonstrate selfless service to others. The Sullivan Awards are the university’s highest honor recognizing service. 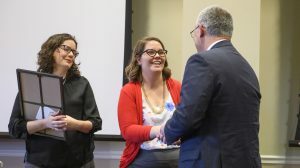 “These award recipients and finalists have distinguished themselves through their outstanding commitment to serving others,” Interim Chancellor Larry Sparks said. “Their efforts go far beyond affecting individual lives – their contributions and spirit ripple through our community. Krista Oliver was presented the Student Award. Karen T. Peairs received the Staff Member Award, and Faculty Member Awards went to Anne Cafer and David Calder. The Community Member Award was presented to Libby Lytle of Oxford. Originally from Tula, Russia, Oliver is a senior majoring in broadcast journalism, with a minor in political science. 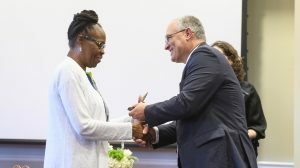 She was honored for her role as a community assistant in Crosby Hall, where she has been an advocate for students’ health and wellness through bulletin boards and interpersonal interactions. Peairs serves as assistant director for career services in the UM School of Law. She has worked to address the unmet legal needs that plague the state of Mississippi, having served many roles with bar associations within the state. Most recently, she was appointed to the Access to Justice Committee of the Mississippi Bar Association and sits on the Board of Directors for North Mississippi Rural Legal Services. An assistant professor of sociology, Cafer also serves as coordinator for the Applied Policy and Community Research Institute housed in the UM Center for Population Studies. She works primarily in Sub-Saharan Africa and the Mississippi Delta, where she examines community resilience and social change around food procurement, agricultural systems, environmental sustainability and health/nutrition. Cafer’s advanced courses are community-based, participatory research courses where students are actively involved with community stakeholders to explore collaborative solutions to nonresilient systems. Calder, a clinical professor in the law school and director of the Child Advocacy Clinic, provides training for attorneys and child advocates. He also serves on numerous committees that address policy issues affecting children, including the Guardian as Litem Training Committee, the Parent Representation Committee, the Governor’s Task Force on Children’s Justice and the board of directors of Court-Appointed Special Advocates of Lafayette County. Lytle has been in service to the Lafayette County community for 22 years. She retired at the rank of captain from the Oxford Police Department in 2017, with a combined 27 years in law enforcement. Causes to which Lytle has volunteered include the Human Trafficking Task Force, Oxford-Lafayette Homelessness Committee, Mississippi Assistance Program Committees for both adults and children, and Party in the Park Committee. An adjunct professor in legal studies at Ole Miss, Lytle also serves as an adult advocate, coordinator of volunteer programs and crisis hotline worker at Family Crisis Services of Northwest Mississippi. The new Excellence in Community Engagement Award recognizes outstanding accomplishments in community-engaged research, learning, service and scholarship. Criteria include a strong collaboration between the university and partnering communities for the mutually beneficial exchange of knowledge and resources in a context of partnership and reciprocity while fulfilling the university’s mission of scholarly learning, research and service. Two projects were selected to receive the Overall Community Engagement Award and $5,000 each for their community-engaged work. They are Base Pair: A Biomedical Research Mentorship; and Behind the Big House: Interpreting Slavery in Local Communities. Base Pair is a 27-year-old collaboration between the UM Medical Center with Mississippi public and private high schools to enhance science education, accelerate STEM education and influence the development of future health care practitioners in Mississippi. Behind the Big House is a collaboration with academic researchers that ensures historical tours immersing visitors in re-creations of the antebellum era move beyond the large mansions to explore the many extant slave dwellings and interpret the experiences of enslaved people who inhabited them.